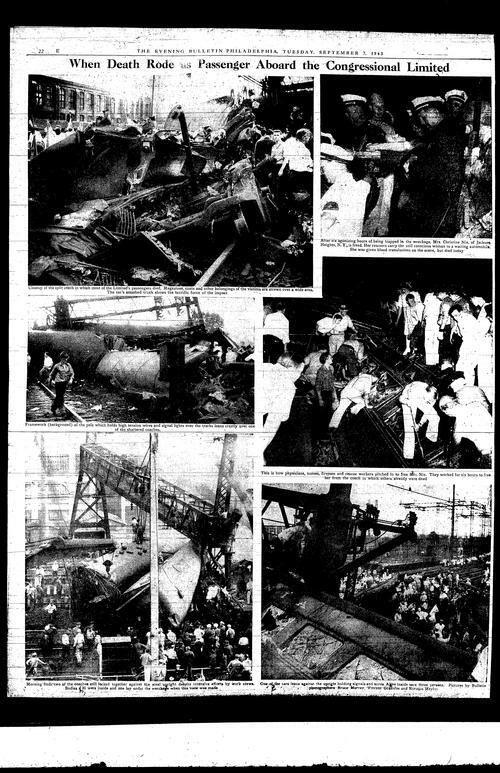 Last week’s deadly train derailment in the Port Richmond section of Philadelphia was eerily similar to a crash that happened at the same junction on Labor Day in 1943. 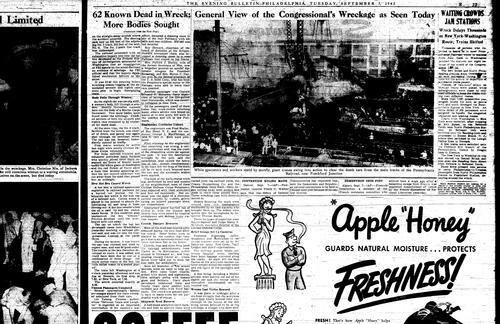 The 1943 accident involved the sixteen-car Congressional Limited which originated in Washington and was bound for New York. 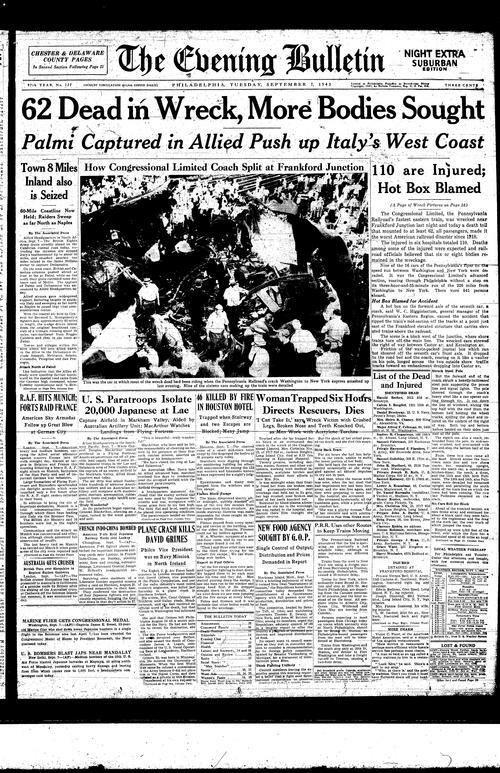 Of the 541 passengers on the Limited—many of whom were military servicemen on leave—79 were killed and 117 injured. Using Free Library resources we can contextualize this incident. 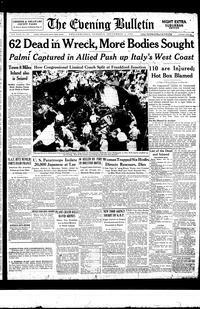 Below are links to the front page and subsequent article and photos that appeared in the Evening Bulletin on September 7, 1943. The fourth is to a plate from G. W. Bromley’s 1925 Atlas of the City of Philadelphia on the Greater Philadelphia GeoHistory Network website. The Free Library owns an original copy. In rich detail it shows the trackage, businesses, industry, and housing in the area as it existed at the time, well before the Pennsylvania Railroad had electrified that stretch of their network. Today the Northeast Corridor is one of the most heavily trafficked train routes in the United States, shuttling commuters and tourists alike. In 1943 the Corridor was important to the country’s World War II efforts, serving as an artery for moving goods and serviceman. But with resources and manpower being used overseas, the nation’s railroad infrastructure suffered. With a focus placed on keeping trains moving, insufficient maintenance and safety resulted in an increased number of railway accidents. Haine, Edgar A. Railroad Wrecks. New York: Cornwall, 1993. 111-112. Print. Ivory, Karen. Pennsylvania Disasters: True Stories of Tragedy and Survival. Guildford, Conn.: Insiders' Guide, 2007. 87-92. Print. Lancaster Chapter of the National Railway Historical Society newsletter the Lancaster Dispatcher. 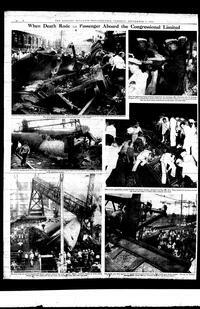 "September 6, 1943 - The Wreck of the Congressional Limited at Philadelphia , Pa ." LANCASTER DISPATCHER (Sept. 2009): 1-3. Lancaster Chapter, National Railway Historical Society. Web. 15 May 2015.